This year the theme of the Lions Clubs International Peace Poster Contest is “KINDNESS MATTERS.” For thirty one years Lions clubs around the world have proudly sponsored this contest in local schools and youth groups. Young people (ages 11, 12, and 13 by November 15, 2018) are eligible to participate in the contest which allows them the opportunity to express their visions of peace through using a variety of mediums including charcoal, crayon, pencil and paint. No computer art is allowed. The works vary greatly and reflect the young artists’ life experiences and culture. Please order your kits by October 1, 2018. You can order the kit for $11.95 through LCI by either calling Club Supplies at 1-630-571-5466 or ordering the kit on line. One kit per group or school is needed. Club entries must be brought to the 2nd District meeting on October 20th for judging. Please make sure that you follow the directions for labeling each poster entry. The winner will be sent on for the next level (the MD4 contest) by the District Governor. Deadline for the District Governor to submit one winning entry is December 1, 2018. The Multiple District winner must be submitted to the Public Relations Department of Lions Club International by December 15, 2018. The winner will be notified on or before February 2, 2019. The winning poster will receive a cash award of $5,000 and a trip to a special award ceremony. There will also be awarded 23 merit winners. They will receive a cash award of $500 and a certificate of achievement. 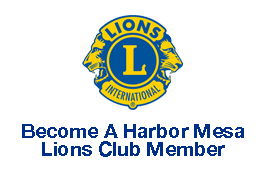 Stay in contact with the Harbor Mesa Lions Club! Lions Clubs International is the world’s largest service club organization with more than 1.3 million members in approximately 45,000 clubs in more than 200 countries and geographical areas around the world. Since 1917, Lions clubs have aided the blind and visually impaired and made a strong commitment to community service and serving youth throughout the world. Interested in joining our club? It's easy! Just contact us or let one of our members know. You can see us in action by visiting us at our monthly meetings or events. "You can't get very far until you start doing something for somebody else."